For my last entry on the heraldry at the original settlement at Jamestown, Virginia, I’ve got a photograph of something that I’ve seen way too often here in the United States. This one is one of four on a large monument at the site. 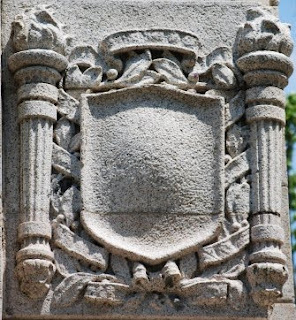 That’s right – it’s an empty shield, a very common architectural and decorative motif. In my review of heraldry in downtown Dallas, Texas, near where I live, I found that empty, blank shields and oval shields were far more common than shields and ovals with heraldic designs on them. But still, when there’s so much heraldry available, and that could be appropriately used, for such architectural decoration, why use a blank shield? Perhaps your urge to paint the blank is not far off the mark; surely it is quite possible that originally they weren't blank at all but were in fact painted and displayed the arms of the owner in full glory. The very worn look of this example would not rule out an original painted shield. Perhaps the offer of a pint for your local forensic officer might solve the riddle?